Maurice Kann, Paris; (Duveen Brothers), 1908, as part of the Kann collection; purchased February 1910 by Peter A. B. Widener, Elkins Park, Pennsylvania; inheritance from the Estate of Peter A. B. Widener by gift through power of appointment of Joseph E. Widener, Elkins Park, 1942. 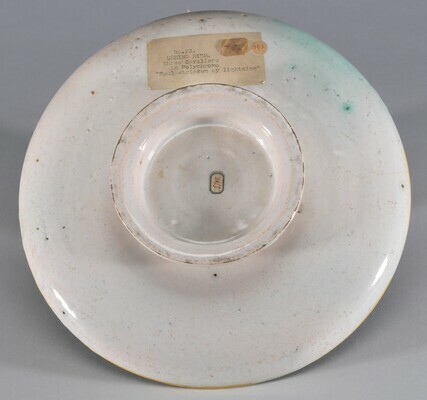 Earthenware, covered front and back with a white tin glaze, which is pockmarked on the reverse. The painting is in blue, green, yellow, orange, purple, turquoise, brown, and white; the green has bubbled. There are four kiln-support marks carefully placed on the edge. The rim is chipped. Inventory of the Objects d'Art at Lynnewood Hall, Elkins Park, Pennsylvania, The Estate of the Late P.A.B. Widener. Philadelphia, 1935: 66, as Urbino, c. 1540. Works of Art from the Widener Collection. Foreword by David Finley and John Walker. National Gallery of Art, Washington, 1942: 14, as Urbino, about 1540. Distelberger, Rudolf, Alison Luchs, Philippe Verdier, and Timonthy H. Wilson. 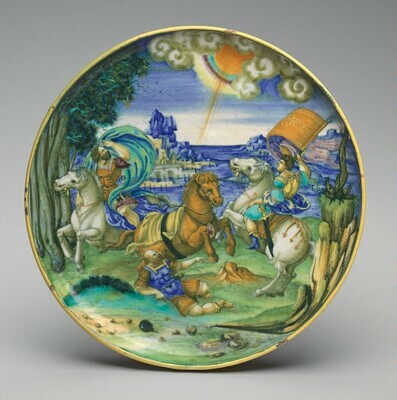 Western Decorative Arts, Part I: Medieval, Renaissance, and Historicizing Styles including Metalwork, Enamels, and Ceramics. The Collections of the National Gallery of Art Systematic Catalogue. Washington, D.C., 1993: 202-204, color repro. 203.